Last week we discussed the changes the NCBE made regarding unscored questions. For the upcoming February 2017, there will now be 25 “test” questions which will not be scored, up from the 10 “test” questions on previous exams. 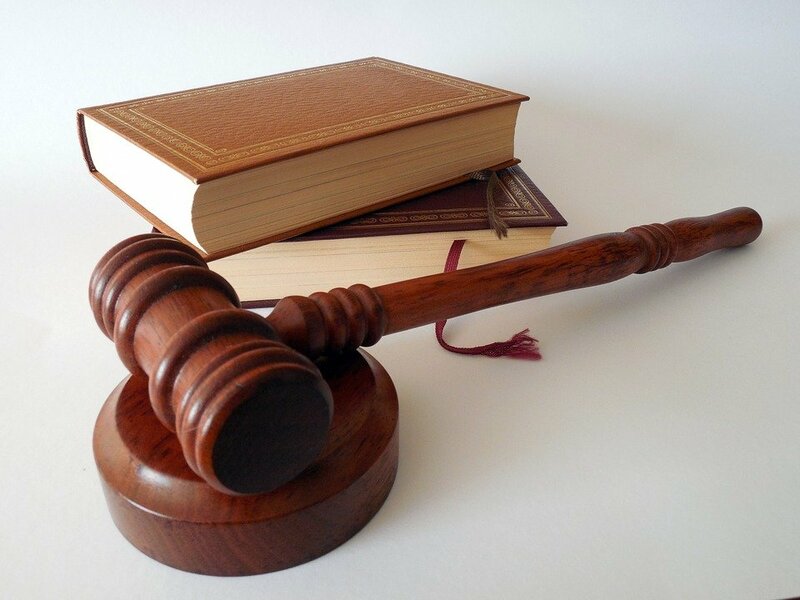 Before, there were 27 scored questions on each of the seven MBE subjects (Civil Procedure, Constitutional Law, Contracts, Criminal Law and Procedure, Evidence, Real Property, and Torts); now there will be only 25 scored questions on each of the seven subjects. 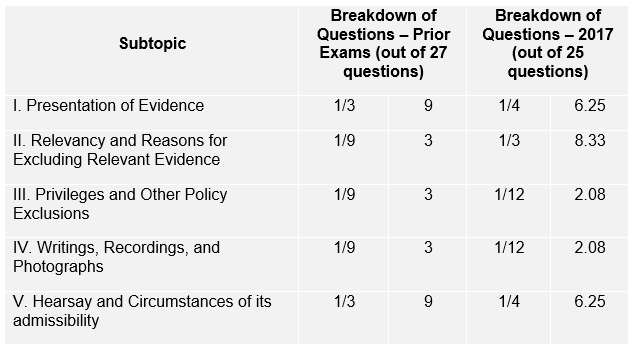 That change affected the number of questions that would be scored from each topic. Focusing specifically on Evidence, the NCBE also changed the proportion of how subtopics will be tested on that portion of the MBE. This is what you need to know. The NCBE publishes on their website subject matter outlines for each of the seven subjects, breaking down what subtopics will be tested and also the proportions of how many questions will be asked from each subtopic section. The good news is that the outline itself for Evidence has not changed, meaning the topics that will be covered have not changed. However, what has changed is the question breakdown. The instructions at the top of the outline have changed so that the proportions of how many questions will be asked from each subtopic section are now different. The five subtopics for Evidence that are tested have remained the same: (I. Presentation of Evidence; II. Relevancy and Reasons for Excluding Relevant Evidence; III. Privileges and Other Policy Exclusions; IV. Writings, Recordings, and Photographs; V. Hearsay and Circumstances of its admissibility). The five subtopics have not changed. Those studying, will still need to study all five of the same subtopics. However, the focus on each has changed some. Most notably, Relevancy went from being among the least tested subtopics to being the most heavily tested subtopic. This means that examinees should spend significantly more time studying Relevancy than they would have in previous years. Consequently, the topics of Presentation of Evidence and Hearsay, which were once the most heavily tested, will now have fewer questions. However, these subjects will still be tested on the MBE as well as the MEE and likely also the state portions of the upcoming bar exams. Therefore, these topics should not be neglected, especially Hearsay, which has always been a favorite topic of examiners and a struggle for examinees. The distribution of subtopics Privileges and Policy along with Writings, Recordings, and Photographs have both dropped by about one question. This should only have a small impact on study patterns, which will likely remain the same for these subtopics. AdaptiBar has several key features that allow users to focus in, not only on a topic, but also on subtopics as well. AdaptiBar has two unique modes users can answer questions in: 1) Practice Questions Mode; 2) Practice Exams Mode. Firstly, in Practice Questions Mode users can select by topic what area they would like to answer questions in. In this mode, users can specially select to answer questions from Evidence. Then users will be presented questions based on their individual strengths and weaknesses. In this way, users can sit back and let AdaptiBar help them strengthen the areas they are the weakest in. Secondly, in Practice Exams Mode, users can select by topic and even narrower by subtopic which areas they would like to be tested on. In this way, users can focus specifically on Relevancy, or any other subtopic of their choice, to practice questions in that selected area only, while simulating test-like conditions. Additionally, AdaptiBar allows users to track their performance in their own Performance Analysis Center. Here, in Subject Analysis, users can track how well they are doing overtime in the topic of Evidence. Also, in Subject Performance, users can track their overall performance by topic and subtopic. In these ways AdaptiBar can help users by not only allowing them to practice questions in the exact area they want to focus on, but it also then gives them a detailed analysis of how they are performing in these areas. Sign up today to master Evidence and know you’ll pass! Be sure to check back for our final blog in this series, Part IV: Real Property Changes Scope and Coverage.